Pure Minerals (ASX:PM1) yesterday updated the market with additional results from its first phase of drilling at the Battery Hub manganese project, which is situated in Western Australia’s Gascoyne region. 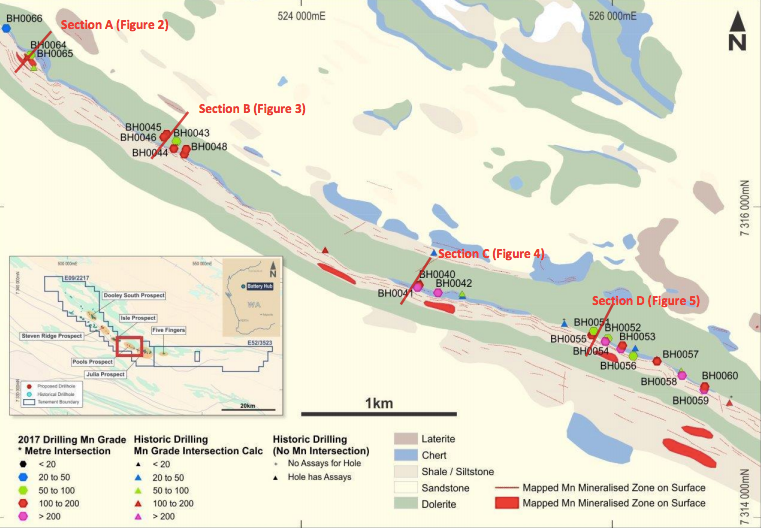 The results come from 24 reverse circulation (RC) drilling holes located at the Pools Prospect, situated at the eastern end of tenement E09/2217 and immediately west of the Julia Prospect. Drilling indicates the presence of thick, continuous mineralisation, extending over an entire five kilometre strike length at Pools. It should be noted, however, that PM1 is a speculative stock and investors should seek professional financial advice if considering this stock for their portfolio. Key statistical highlights of the drilling include the fact that very drill hole except one encountered manganese mineralisation, with 27 significant primary intercepts being observed with an average thickness of manganese mineralisation of 18.6 metres. Mineralisation was found to be shallow, extending from surface to and average maximum depth of 28.8 metres — and also remains open at depth and along strike. Further, geological and grade continuity appears very high over the entire five kilometre strike length, and 13 of the intercepts included a medium grade core averaging 10.2 metre thickness with a weighted average grade of 11.1 per cent manganese occurs consistently along strike. In addition, a higher-grade core averaging 2.5 metres thickness and 26.65 per cent manganese was also observed in six holes that intersected zones of supergene enrichment. This mineralisation has a median maximum depth of only eight metres but is observed up to 48 metres in depth. Commenting on the results, PM1 CEO Sean Keenan said: “The drilling at Julia and Pools prospects points to the potential for a large tonnage, low strip-ratio resource that, if beneficiation testwork proves to be successful, could yield a district-scale manganese project. 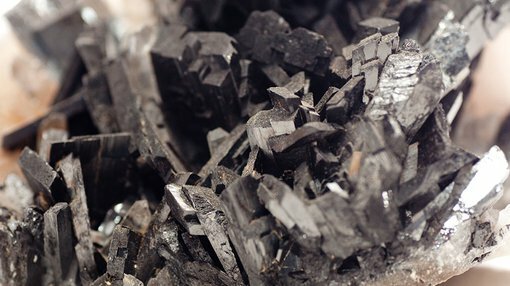 “The project so far exhibits some very favourable attributes for the development of a mining operation, namely higher-grade mineralisation near surface, allowing for lower capital expenditure and early cash flow generation, and a potentially large lower-grade resource for long-term sustainable production,” he said. The 79 hole, 2,880 metre RC drilling program, which was completed in December last year, tested for shallow (less than 60 metres in depth) manganese mineralisation with bulk tonnage potential at the Julia, Pools, Isles and Steven Ridge prospects, all located within tenement E09/2217. An additional objective here was to confirm historic drilling for which no physical records remain. More than 1,500 samples, comprising 413 composite samples and 1,125 one-metre split samples, were submitted to ALS Global laboratory in Wangara, WA, for assay testwork in December. PM1 plans to use this drill data, as well as the historic database of more than 500 drill holes, in the calculation of a maiden JORC Resource. PM1 expects to release results from an additional 13 holes from the First Phase drilling program at additional prospects — the Isles and Steven Ridge — in the coming weeks. These results will be used to plan additional Phase 2 drilling within the E09/2217 tenement at Battery Hub, which PM1 expects to initiate early this year. In conjunction with this drilling, PM1 will drill RC holes within its adjacent E52/3523 tenement, which contains the prospective Five Fingers prospect.